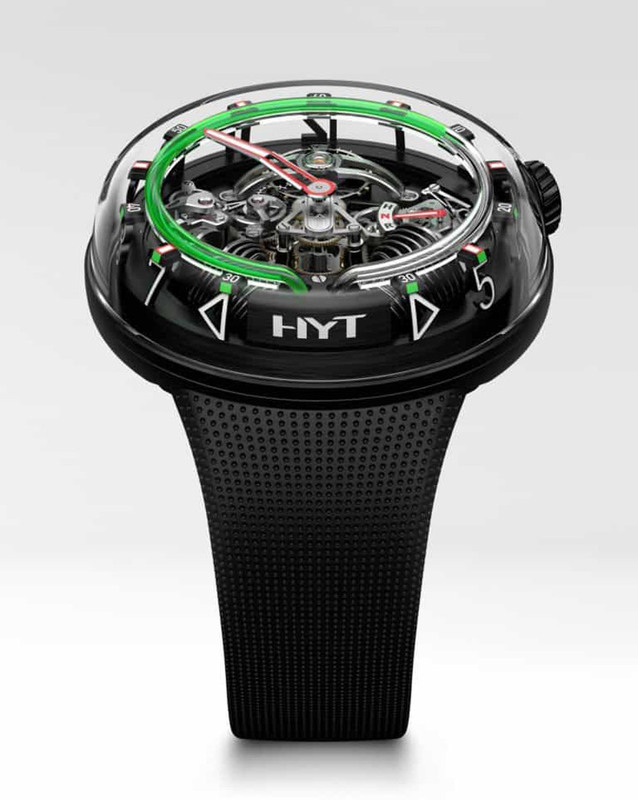 At the SIHH 2018, HYT presented two new watches that follow a similar approach of lastyear’s HYT H0 Origin, but with a redesigned case and a more prominent box domed sapphire crystal. 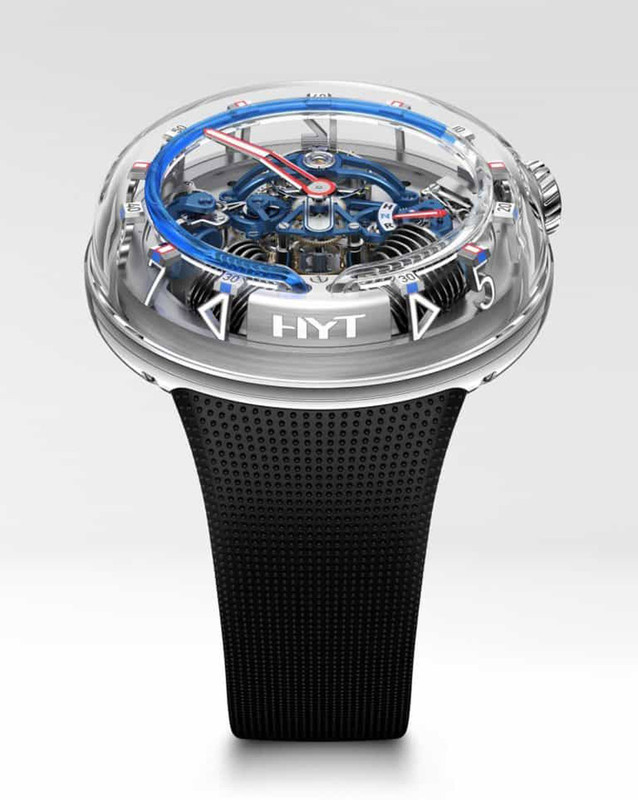 The new HYT H20 is rooted in the continuous movement of a colored and a transparent fluid in a capillary and is fitted with a case measuring 51 mm in diameter and a thickness of 19.95 mm, that could make it almost unwearable. A cloche-like sapphire crystal offers and intriguing lateral view of time’s progress. It takes the memory to the pristine equipment of a science laboratory and the imagination to the protective display of a precious item, in this case time. Viewed from the side, the digits, markers and directive arrows appear to be floating. Yet, their anchor is pure precision. There are two limited editions of the H20, each comprising 25 numbered pieces. One is clothed in black and harbors a bright green fluid, while the other has a silver-colored case and deep blue liquid. Their universal design language is transparency, accenting aesthetics and technical detail simultaneously. The angled positioning of the two bellows that propel time forward in the patented HYT micro-fluidic module is the gateeway to an overall appearance sith a distinctive 3D character. A jumping minute hand, crown position indicator and thermal indicator are further elements of this live performance in a meticulously constructed theater of time. The H2O traces and embraces the essence of flow.